Do you have your own business sourced with Spoonflower fabric? Maybe you’re a fashion designer working on a big collection? That means you order a ton of fabric. We think it’s awesome that you’re choosing custom-printed, eco-friendly Spoonflower products, which support indie designers and creates less waste overall. We really appreciate your loyalty! So much so, that we felt like you deserved an even better discount. As of now, any order over 20 yards (whether it’s 20 yards of the same design or 20 different designs!) 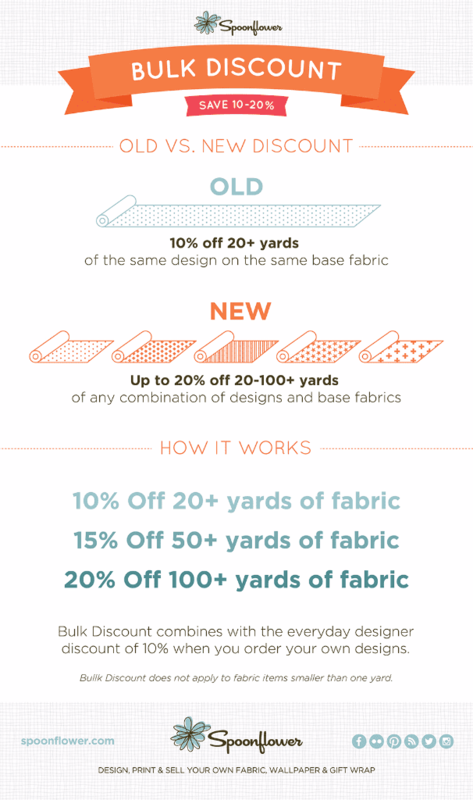 of fabric is eligible for a 10% bulk discount. Even better: orders of 50 yards or more will receive 15% off and orders of 100 yards or more will receive 20% off. Whether you’re adding to your fabric stash, sourcing fabric for your products, or planning a BIG project, we’re giving you more fabric for less. [Read more…] about Announcing: The New Bulk Discount!